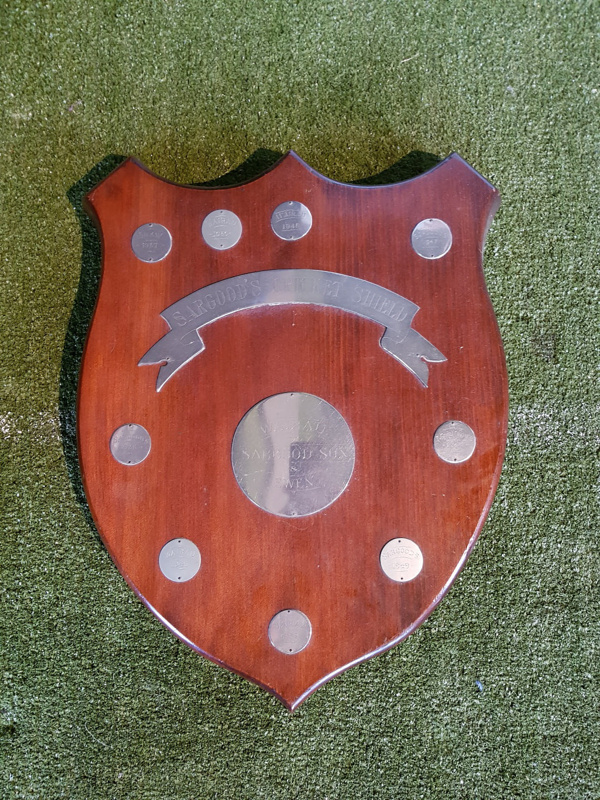 About this objectSargood's Cricket Shield was played for between teams representing Wairau, from Marlborough, and Sargood, Son, and Ewen - a company with offices in London, Melbourne, Auckland, Wellington, Dunedin, Christchurch, and Invercargill. Sargood's also had a team in Wellington's Mercantile Cricket League. According to the discs on the Shield, competition began in 1937 and was played annually until 1950, with a break for WWII from 1941 to 1945. On the back of the Shield a photograph has been glued featuring the team and signatures of the 1937 Sargood's team. In 1940, instead of a winning team being written on the Shield, "A Good Show?" has instead been engraved. A cricket match is being played at Kelburn Park this afternoon between a team from Wairau and a team representing Sargood, Son, and Ewen. Owing to rain there was no play this morning. The Wairau team arrived by air on Saturday and was entertained at a dance at night. Yesterday it was taken for a motor drive to Akatarawa and around the bays. It will return by the Tamahine tonight. Messrs. D.A. Ewen and A. Cramond entertained the two teams at lunch,at the Kelburn Kiosk today, Mr. Ewen extending a welcome to the visitors. The captain of the visiting team, A. Barratt, responded. Wairau.— A. Barratt (captain), N. Dames, G. Stevenson, H. Auty, A. Cresswell, E. Hicks, J. Ahem, J. Laird, S. Avery, H. Adams, S. McMillan, and A. Kenny. Sargoods.— A. Thompson (captain), C. M. Steven, G. Carter, C. Smith, D. J. Alexander, D. R. Alexander, E. Shrimpton, A. Gazley, R. Cook, A. Brimer, and S. Ward. Medium and MaterialsWooden shield with metal adornments.